Çalışkan was surprised when a crowd showed up to support him after he was handed eviction notice. Since then, protesters regularly gather in the neighborhood to protest the eviction. The grocery store of Ahmet Çalışkan, an 87-square-meter establishment in Berlin's Kreuzberg, is the scene of a fight against gentrification in this bohemian quarter of the German city. Çalışkan was handed an eviction notice in March, telling him to leave the premises by Sept. 30. He is apparently the latest victim of property developers who buy out decades-old shops and houses in the district to renovate and sell to affluent customers for astronomical prices. Small businesses like Çalışkan's, which is located in a building where other occupants agreed to sell their residences and shops, have little chance to resist. As Çalışkan, 55, was brooding over the fate of the grocery store he opened 28 years ago with his father Şükrü, he told his loyal customers who have been shopping from the humble shop for decades about the eviction. A few days later, a crowd made up of his clientele convened in front of the shop in Wrangel Street and rallied against the eviction. Since then, they regularly stage rallies outside the shop as part of a wider campaign against gentrification, something Çalışkan did not expect. 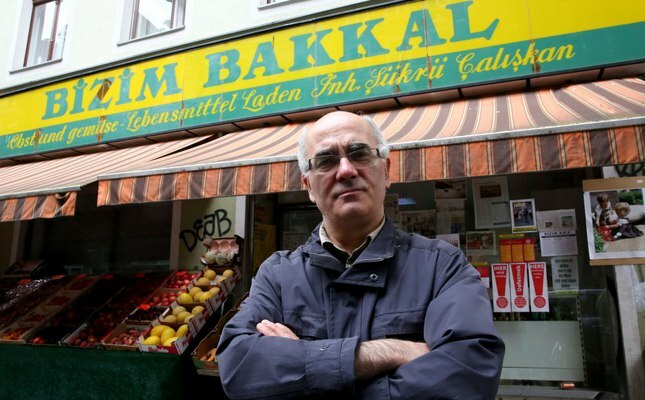 His "Bizim Bakkal" (Our Grocer) eventually became a symbol for the fight with customers joined by activists opposing the eradication of old Berlin and memories of a vibrant neighborhood. Posters and flyers reading "Je Suis Bizim Bakkal," in the vein of protests after the fatal Charlie Hebdo shooting in France and signifying Bizim Bakkal must stay, are now posted everywhere in the neighborhood. Activists also set up a website called "Bizim Kiez" (our neighborhood). The website includes a map of Berlin with areas under the threat of being gentrified. Speaking to Anadolu Agency (AA), Ahmet Çalışkan said his grocery store was a family business where he worked with his wife and children. Together with his father, a migrant worker who lost his job at a factory, Çalışkan started up the business two years before the Berlin Wall fell, leaving Kreuzberg at the center of reunified Berlin. Soon, the district became a hub of nightlife and bohemian lifestyle. "Ninety-five percent of our customers are Germans and everyone knows each other," Çalışkan said, emphasizing that they are a close-knit neighborhood. "The building where the shop is located was sold in January. The new owner gave an eviction deadline of Sept. 30. I can only stay here if they agree to extend my leasing contract, otherwise, I will be kicked out," he added. Çalışkan heeded the advice of a fellow shop owner who urged him to share his woes to his customers. "He told me that the customers would help my cause. I told it to Thomas, a teacher and a regular customer. Later, he came up with a flyer. We decided to pass it around the neighborhood. Soon, people started to show up here [in support]. They organized an event and since the last month, they regularly convene to protest the eviction," he said. Apart from customers and activists from various nongovernmental organizations (NGOs), Çalışkan's Bizim Bakkal has received the support of fellow shop owners who adorn shop windows with "Je Suis Bizim Bakkal" banners. Property prices in Kreuzberg recently increased up to 54 percent with residents blaming moneyed developers who are out to gentrify the neighborhood. As owners of old buildings slowly give in to developers, Bizim Bakkal may change the fate of this neighborhood, as Çalışkan says he will be here again the day after the deadline along with other protesters determined to fight the eviction. Still, it is not known how the property developer will respond to a letter by lawmakers from the Green Party and left-wing parties, appealing the company to stop the eviction.